The Di Natale¦© Recycleme¦© collection offers a stylish range of environmentally friendly notebooks all designed and made in Italy. Products from the Recycleme¦© collection are all made using 100% recycled card. Available on a choice of colours and finishes your note book can be supplied with a choice of printed pages lines squares plain or diary pages. 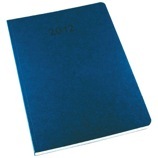 Choose from bound or wirobound notebooks and diaries.